"No assembly required and has an automatic water level indicator." "Doesn't require screws or extra parts for set up." "Can hold up to a nine foot tree with a whopping six inch diameter trunk." "Has a large water reservoir that can hold up to two gallons." "Backed by welded tubular steel for extra stability." "Lightweight and portable design which is great for storage purposes." "Features a control box for turning on lights and rotating." "The perfect rustic-chic tree accessory." "Its four legs fold flat so you’re able to easily store it after the holidays." With a best selling label and over 800 reviews, the Krinner's Tree Genie XXL is an easy choice for overall tree stand winner. With no assembly required, and an automatic water level indicator included, this product takes the guesswork out of keeping your tree in its best state. Unlike other models, this stand doesn’t come with screws or assembly required. To use, simply place the tree in the stand, hold it and then pump the foot pedal until the claws grasp the tree into place.This patented structure is designed to hold trees up to 12 feet tall securely in place with only a few minutes of assembly required. Plus, its automatic water level indicator retains up to two-and-a-half gallons of liquid, so can you rest-easy knowing your accent will be watered — even on the days you forget! Customers rave about the product’s sturdy base and easy mounting. Based on the design, they state it’s easy to rotate the trunk as well if need be. They also claim that this stand works particularly well on larger trees with a wide base. One reviewer even claimed, “This is by-far the best stand I've ever used.” Since many of the commenters have been using the product for years, the longevity of the product simply goes unstated. With a stand like this, you can spend more time doing your holiday shopping and less time struggling to set up your tree. This innovative design doesn't require screws or extra parts—all you have to do is lock the steel grips in place and insert the trunk into the stand. 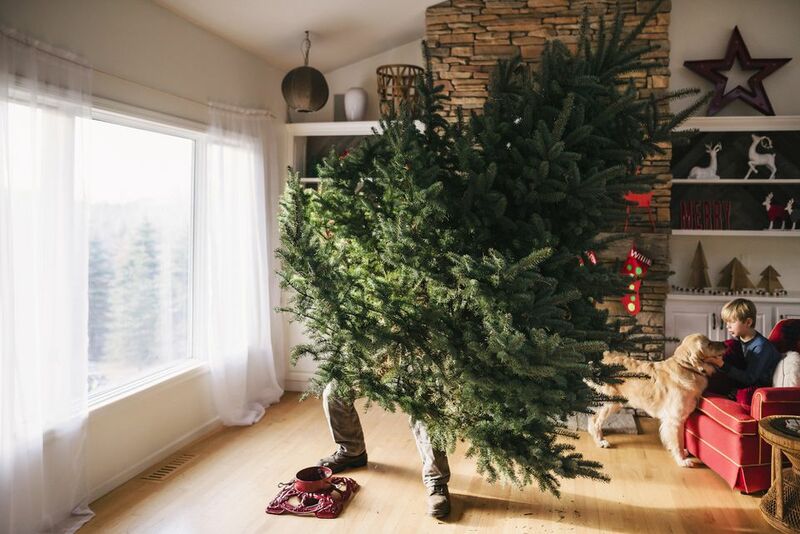 Within seconds, you’ll have a perfectly stationed Christmas tree that is ready to be decorated. This stand works well with any tree up to 9’ tall and trunks with 4.2” in diameter. To ensure that your tree is securely in the base, double check that the steel blades are firmly locked. The whole process should take about 10 seconds. For maintenance, there's an easy-fill reservoir (3.5 liters) that makes watering effortless, so it’s one less thing to worry about during the busiest time of the year. Yes, live Christmas trees are a thing. With the idea being you can bring your Christmas tree in from outside each season and then plant it back outside once the New Year rolls in. People chose this option because they feel that it is more environmentally friendly. Because a live Christmas tree has lots of roots you'll need more of a bucket to keep the tree fresh and healthy. This base can hold up to a nine foot tree with a whopping six inch diameter trunk. Once the stand is set up (less than five minutes) the whole tree (roots and all!) get placed into the bucket, and the turn straight system will ensure it sit prettily inside. A one-gallon basin for water keeps your tree nice and hydrated. With a 10-year warranty this base will last you for the long haul, which you'll need with a living and growing tree outside your window. Here’s another solid tree stand option for your home. Although it requires more assembly than the top choice, its large water reservoir and dependable frame give it “runner up” status in our product feature. For this stand, three strong galvanized pins are included to help lock and centralize the tree in place, before the reinforced screws put in its final position. While this may take some time to complete, once it’s done, the stand holds any tree up to ten feet securely in place. Backed by a spill-proof guard and a water tank that can hold up to two gallons, keeping your tree moist will be a non-issue. For extra reinforcement, here’s an option by Jack-Post that’s backed by welded tubular steel for extra stability. Built with the classic design you grew up with, it’s a trusted source for all Christmas tree aficionados who turn to it year after year. This product was built to keep trees up to 12-feet tall and six-and-a-half inches in diameter stationed in place for all the days of the season. Between the welded steel and the four reliable eye-bolts, the tree doesn’t stand a chance of tipping. Plus, the base is able to hold nearly two gallons of water, and is reinforced by zinc-dichromate hardware to prevent deterioration. From one of the reviewers who is a welder himself, he can confirm the strong metal disposition behind this red-and-green beauty. While there may be extra weight with this product, the strength and sturdiness it provides makes it worth the haul. Some prefer a plastic stand because of its lightweight and portable makeup. For apartment dwellers especially, a product made of this material is great for storage purposes. When it comes to the best plastic stand to go with, the Jack Post Handythings model is an excellent choice since it only weighs a total of three pounds. The stand accommodates large capacity trees up to eight feet tall and six inches wide. The base holds up to one gallon of water, and is supported by a “spill catcher” for the occasional overwatering. To stay in place, the frame contains a stabilizing spike and steel nut screws for smoother assembly. Bonus: The five gold-tone screws are made of wear-resistant hardware, so their exteriors won’t be compromised as you use them through the years. Supplemented by a five year warranty, this is one tree stand that’ll last you for all the occasions to come. One note of caution from consumers: This is not a universal tree stand, so ensure you select the most appropriate choice for your tree from the three sizes available by the retailer. Of the comments provided, most of them were from repeat buyers — which is always a great sign. They note how easy the stand makes it to decorate the tree, with no squeezing between the walls required to place ornaments on various branches. Their one callout is to ensure the stand is correctly-sized to fit your tree, which can often be confusing for faux buys. All around, most individuals were happy with their new holiday purchase. The Wood Tree Stand from the Holiday Aisle is rustic elegance at its finest. Featuring a standard wood stand design, this simple yet charming tree stand will make for a neat, functional addition to your home this Christmas season. This tree stand is solid and durable, so it will provide superior support for your tree. Depending on how large your Christmas tree is, you can purchase one of three different sizes. The smallest size weighs four pounds, the medium size weighs five pounds, and the large size weighs nine pounds. You can use this stand inside or outside, but it's important to note that it's made for artificial trees. If you're looking for a stand that isn't your ho-hum plastic option, The Holiday Aisle Wood Tree Stand is the way to go. It's the perfect rustic-chic tree accessory! This holiday season, deck the halls with boughs of holly—and deck out your Christmas tree with a foldable stand that’s functional, stylish, and sturdy. Colorful tree stands will provide a pop of color, but if you're looking for an understated option that blends in with your tree, this is the way to go. The Wayfair Basic Folding Tree Stand is made of durable steel and is designed to fit artificial Christmas trees that measure anywhere from 6’ to 7.9’ tall. This popular stand includes three thumb screws, and its four legs fold flat so that you’re able to easily store it when the holidays are over. It's available in five different sizes, so you can find the best fit for your tree, no matter how big or small it might be. Reviewers write that this tree stand has an affordable price point and fit their tree perfectly. A few people also commented that this makes a fabulous replacement stand. We bought three top-rated Christmas tree stands and our reviewers tested them daily for weeks on end. We asked our testers to consider the most important features when using these Christmas tree stands, from their design to their sturdiness. We’ve outlined the key points here so that you, too, know what to look for when shopping. Tree type The first thing to consider when shopping for a Christmas tree stand is whether you’ll have a real tree or an artificial one. Live trees are heavier and require sturdier stands and models with a water reservoir. Tree size Christmas trees range anywhere from three to 20 feet tall (or more! ), and the size of your tree will dictate which stand will work best for you. The larger the tree, the bigger the stand’s base needs to be to keep it safely upright. Luckily, most stands indicate the biggest tree they can accommodate. Material In general, tree stands are made of plastic, metal, wood, or some combination of the three. Your stand’s material will affect how sturdy it is — keep in mind that metal stands are generally more durable than plastic ones. This tree stand impressed one of our testers because it was easy to set up and sturdy: “The mechanism that secures the tree in place is far better than a screw-in tree stand,” he explained. “And it's a super sturdy base, so you don't have any concerns about the tree tipping over.” Our reviewers also noted that, even though it’s an XXL-sized stand, it also fits smaller trees. However, one tester thought that its plastic material felt “somewhat cheap,” especially given its higher price tag.